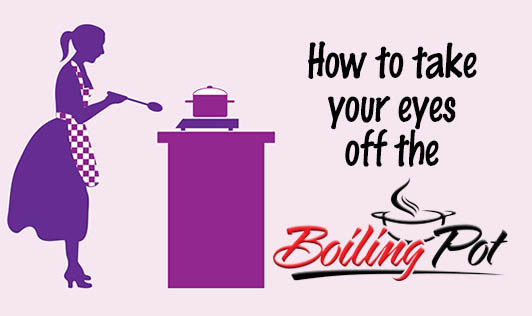 Keeping a watch on a boiling pot of milk or water can be time consuming and may restrict you from moving out of the place to finish other tasks. Now here is a solution. Simply place a wooden ladle across the top of the pot. This won’t prevent the milk/water from spilling off the pot but will definitely delay the spilling off appreciably well. This can allow you to leave the pot to boil while you are away for a little longer to complete another job. How does this work? Boiling forms foam on the surface owing to bubbles being created at the air-water interface. These bubbles increase the surface area at the interface and tend to raise the volume that causes spilling over. If these bubbles are punctured, the spilling over can be prevented. For this purpose a hydrophobic agent like a wooden ladle can be placed on the top of the pot in order to break off the bubbles. However, over time as excessive bubbles form or if a strong surfactant is present in the boiling water, the content spills over eventually. Another explanation for this mechanism is that the foam is filled with steam at 100°C. Anything below this temperature that comes in contact with this foam will puncture the bubbles. Since the wooden ladle doesn’t get heated up, spilling over is prevented. However, this causes the wooden ladle to warp at times. So now use an old/unwanted wooden ladle to keep your boiling pot from spilling over too fast and allow yourself to multitask for longer.